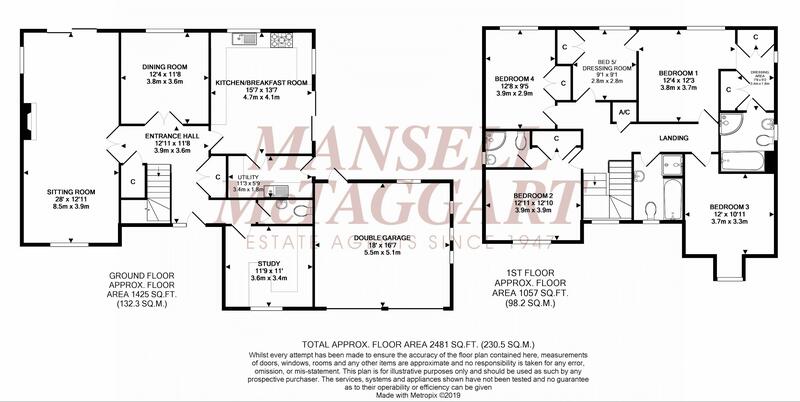 We are pleased to bring to the market this executive, detached family home located Kingsfold Close. The property forms part of a small and exclusive development situated off the highly sought-after Marringdean Road - an attractive semi-rural location renowned for its high calibre individual properties. The property is one of only 12 houses built by Cala Homes in the late 1980s, all situated in large plots, with most impressive contrasting brick-faced elevations relieved by part tile-hanging and incorporating leaded light double-glazed windows all under a pitched tiled roof. The accommodation is accessed off a large reception hall, with double doors opening to the large living with a fine feature fireplace and a further set of glazed double doors opening to the dining room. The large study, which provides a third reception room, is ideal for home-based office accommodation and there is a spacious kitchen/breakfast room with a good range of units and a range of built-in appliances. Completing the ground floor accommodation, you can find a well-appointed utility room and ground floor W/C. The first floor has plenty of natural light provided by an attractive arched window and affords five bedrooms with the master and guest bedrooms both having en suite facilities. The property is approached over a herringbone brick paved driveway providing extensive off-road parking facilities which leads to the attached double garage. The delightful mature and secluded gardens provide a splendid backdrop. The house has an exceptionally wide frontage with extensive lawned areas, mature trees and young shrubs. To the rear and to either side are further lawned areas with paved seating areas and adjoined by particularly well-stocked shrub borders designed to provide all-year-round interest, with high beech hedging running across the rear boundary. Perfectly situated for quick access to Billingshurst train station, the property is in the ideal location for those commuting to London. The highly convenient location is within walking distance of a local shop, The Weald School, Billingshurst Primary School and the leisure centre. Billingshurst High Street is within a mile and offers a range of amenities including local shops, restaurants and cafés as well as several churches and good bus service. The mainline station provides fast and frequent services to Victoria/London Bridge (approximately 65 minutes), Gatwick International Airport and the south coast. There are schools for all age groups within the locality, both state and independent, including the Weald Community School/6th Form and Billingshurst Primary School. Private schools in the area include Pennthorpe at Rudgwick and Farlington, an independent day and boarding school for girls located on the outskirts of Broadbridge Heath. The local independent schools all run a convenient bus service from Billingshurst village. The larger towns of Horsham, Guildford and Chichester are all within easy driving distance and there are excellent road links via the A272, A264, A29 and A24 to the M23 and major motorway network. Golf can be found nearby at Slinfold Golf and Country Club and at Rookwood in Horsham and excellent sporting/leisure facilities can be found at the leisure centre in Billingshurst itself.